Let's focus on apps built on the written word--specifically prose, popular nonfiction, and quotations. Because while apps are getting flashier as the world around us becomes increasingly saturated with movies, TV shows and Web series, videos, and games, the written and spoken word still holds a lot of sway--at least in the case of two of three apps we explore this time out. Shane Koyczan's spoken-word poem "To This Day" gets an app of the same name, where the title poem serves as narration for an animated flip book on bullying. It's bleak, onerous material, but the story and animations have just enough humor to make the viewing/listening/reading experience entertaining. It's a difficult balancing act, and it works because Koyczan tells about the unique aspects of his personal experience while spreading a message to his unseen audience--you are not alone, and there is hope. 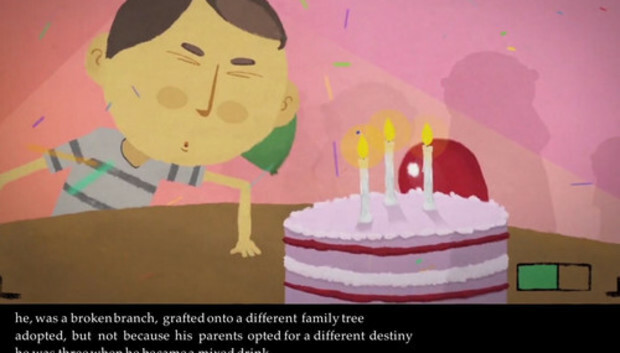 The app is well-designed, allowing users to read the poem in either English, French, or Spanish (the words appear beneath the animation) while Koyczan narrates in English. You can also record your own narration. What's more, To This Day invites repeat viewings, as many pages have animation sequences that change when you revisit them. In short, it's a must-download for parents and teachers, one that could spark many useful conversations--and, at the very least, provide some solace and inspiration to millions of kids. I admit to having mixed feelings about quotations. On the one hand, as Brendan Francis said, "A quotation in a speech, article or book is like a rifle in the hands of an infantryman. It speaks with authority." On the other, as Dorothy Sayers has pointed out, a quotation "saves original thinking." I found both of these references on BrainyQuote, which is rich with similar pithy context- and citation-free extracts. In other words, if you care about accuracy you may want to download the Yale Book of Quotations app. It is unlike BrainyQuote (and similar Web sources) in two significant ways: First, you have to pay for it; and second, it includes not just a quote and a name, but also context, the year the words were written or spoken, and, when necessary, other historical background. From the app, I discovered that Sayers' words are from chapter four of Have His Carcase, and that "Brendan Francis" is Brendan Francis Behan. BrainyQuote says, "When you search the pages of BrainyQuote, you will find quotations spoken by real people--not characters from popular plays, books or movies." But the Sayers quote is from a fictional character, which I never would have discovered without knowing where the quote came from. That's the general argument for taking care when using quotes, but a more specific case can be made for the usefulness of The Yale Book of Quotations app. The app combines the contents of two reference books--one that shares its title with the app as well as The Dictionary of Modern Proverbs. The quotes and proverbs are arranged in alphabetical order by author/speaker, and can be searched by topic, by person, and in some cases by type (among them "Film Lines," "Political Slogans," "Nursery Rhymes," and so on). You can also bookmark searches, pages and individual quotes, save them to Evernote, email them, and post them on Facebook and Twitter. The Yale Book of Quotations app is spare, in a good way--it's not fancy, but it works. It includes an introduction, explanations of how quotes and proverbs were chosen for inclusion, and notes on usage. As for the content, this is a fine combination at a good price--and if you purchased the two books on Amazon, you'd be out more than $50. This card in a stack devoted to overvaluing what we have (or loss aversion) doesn't include any interactive elements, save for some simple tap-to-navigate possibilities and the ability to email the card. Citia is a publishing platform that whittles a book (in this case Predictably Irrational, though you'll find many other titles on the App Store) down to its key ideas, puts them on virtual cards, stacks those cards by topic, and then allows the reader to easily flip through the stacks in any order. The beautiful design and smooth animations make for great eye candy, but disguise some crucial shortcomings. Citia is, in a way, reminiscent of HyperCard and also of Cliff's Notes. Unlike HyperCard, though, this app provides no links little extra material, especially of the multimedia sort, that can differentiate an iPad version from--well, Cliff's Notes. The app provides no way to bookmark, highlight, copy, or annotate material: The single way to save a card for later review is by emailing it to yourself. The app also falls short in that you can only look at one card at a time, in the sequence provided--there's no way to view multiple cards simultaneously or get an overview of the stack as a whole. This is not to say Citia is a bad app, but rather one that provides little bang for the buck, omitting basic, useful functions for no apparent reason. The Verdict: Buy the real book.